The City of New Orleans sold $70,000,000 Taxable Public Improvment Bonds, Issue of 2016, on November 16, 2016, and were delivered on December 8, 2016, to Morgan Stanley & Co., LLC, at 4.363069% TIC. The final official statement is available under the official statement tab at the top of this page. The City of New Orleans sold $55,125,000 General Obligation Refunding Bonds, Series 2016, on September 14, 2016, and were delivered September 28, 2016, to Bank of America Merrill Lynch, as senior book running manager, at 2.723377% TIC. The final official statement is available under the official statement tab at the top of this page. The Sewerage and Water Board of New Orleans sold $100,000,000 Sewerage Service Revenue Bonds, Series 2015, on December 3, 2015 and were delivered December 17, 2015, to Bank of America Merrill Lynch as Senior Book Running Manager at a 4.059947% TIC. The final official statement is available under the official statement tab at the top of this page. The Sewerage and Water Board of New Orleans sold $100,000,000 Water Revenue Bonds, Series 2015, on December 3, 2015 and were delivered December 17, 2015, to Bank of America Merrill Lynch, as Senior Book Running Manager at a 4.052403% TIC. The final official statement is available under the official statement tab at the top of this page. The City of New Orleans sold $75,440,000 General Obligation Refunding Bonds, Series 2015, on November 5, 2015 and were delivered November 24, 2015, to JP Morgan Securities LLC, as senior book running manager, at 2.666795% TIC. The final official statement is available under the official statement tab at the top of this page. 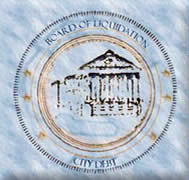 The City of New Orleans sold $65,000,000 Taxable Public Improvement Bonds, Issue of 2015A, on March 25, 2015 and were delivered April 29, 2015, to Robert W. Baird & Co., Inc., at 4.21541% TIC. The final official statement is available under the official statement tab at the top of this page. The City of New Orleans sold $15,527,933 Limited Tax Refunding Bonds, Series 2015A, on January 28, 2015 and were delivered February 26, 2015, to Regions Capital Advantage, Inc. at 1.8455% Fixed Rate. There is no official statement for this bond issue. The City of New Orleans sold $6,489,111 Taxable Limited Tax, Series 2015B, on January 28, 2015 and were delivered February 26, 2015, to Regions Commercial Equipment Finance, LLC. at 2.31% Fixed Rate. There is no official statement for this bond issue. The Sewerage and Water Board of New Orleans sold $14,900,000 Drainage System Refunding Bonds, Series 2014, on November 6, 2014 and were delivered November 20, 2014, to Morgan Stanley & Co. LLC, as Senior Book Running Manager and Bank of America Merrill Lynch and Goldman Sachs & Co., as co-Senior Managers at a net TIC 1.888305%. The final official statement is available under the official statement tab at the top of this page. The Sewerage and Water Board of New Orleans sold $158,990,000 Sewerage Service Revenue and Refunding Bonds, Series 2014, on June 18, 2014 and were delivered July 2, 2014, to Bank of America Merrill Lynch as Senior Book Running Manager and Goldman Sachs & Co., and Morgan Stanley as co-Senior Managers at a net TIC 3.857887%. The final official statement is available under the official statement tab at the top of this page. The Sewerage and Water Board of New Orleans sold $103,525,000 Water Revenue and Refunding Bonds, Series 2014, on June 18, 2014 and were delivered July 2, 2014, to Goldman Sachs & Co., as Senior Book Running Manager and Bank of America Merrill Lynch and Morgan Stanley as co-Senior Managers at a net TIC 4.428838%. The final official statement is available under the official statement tab at the top of this page. The City of New Orleans sold $40,000,000 Taxable Public Improvement Bonds, Issue of 2014A, on December 11, 2013, to Raymond James & Associates, Inc. at 5.90135% TIC. The bonds were delivered on January 21, 2014. The final official statement is available under the official statement tab at the top of this page. The City of New Orleans sold $40,000,000 Taxable Public Improvement Bonds, Issue of 2013A, on January 30, 2013, to Raymond James & Associates, Inc. at 4.678798% TIC. The bonds were delivered on March 1, 2013. The final official statement is available under the official statement tab at the top of this page. The City of New Orleans sold $167,840,000 General Obligation Refunding Bonds, Series 2012, on July 25, 2012 and were delivered on August 28, 2012, to Citigroup as Senior Manager at a net TIC 3.23132%. The final official statement is available under the official statement tab at the top of this page. The Downtown Development District of New Orleans sold $5,485,000 Refunding Limited Tax Bonds, Series 2012, on May 16, 2012 and were delivered on June 13, 2012, to SunTrust Equipment Finance & Leasing Corp. at 2.68% Fixed Rate. There is no official statement for this bond issue. The Audubon Park Commission sold $24,370,000 Aquarium Refunding Bonds, Series 2011A-1, on August 17, 2011, and were delivered on September 22, 2011, to Loop Capital Markets at 3.0852875% TIC. The final official statement is available by clicking the offical statement tab at the top of this page. The Audubon Park Commission sold $630,000 Aquarium Refunding Bonds, Taxable Series 2011A-2, on August 17, 2011, and were delivered on September 22, 2011, to Loop Capital Markets at 1.8725% TIC. The final official statement is available by clicking the offical statement tab at the top of this page. The City of New Orleans sold $40,000,000 Taxable Public Improvement Bonds, Issue of 2010A Build America Bonds, on December 16, 2009 and were delivered on January 19, 2010, to Morgan Keegan & Co., Inc., at 8.404715% NIC. The U.S. Government pledged up to a 35% subsidy of the Taxable BABs coupon interest lowering the TIC to 5.446755% cost to the City of New Orleans. The final official statement is available under the official statement tab at the top of this page. The Sewerage and Water Board of New Orleans sold $23,375,000 par amount of Sewerage Service Revenue Refunding Bonds, Series 2009, on July 7, 2009 at 6.82% TIC to Morgan Keegan & Company, Inc. and were delivered on July 14, 2009. The Official Statement is available under the Official Statement tab at the top of this page. The City of New Orleans sold $75,000,000 Public Improvement Bonds, Issue of 2007, on October 30, 2007 and were delivered on December 14, 2007, to Merrill Lynch & Co., at 5.086344% TIC. The final official statement is available under the official statement tab at the top of this page. CLICK THE DESIGNATED RATING LETTER TO VIEW RATINGS REPORT. This web site contains hyperlinks to web sites owned and/or controlled by parties other than the Board of Liquidation, City Debt (Board). The Board is providing these links to you only as a convenience, and the Board does not endorse, warrant or guarantee the information described or offered at these other web sites. The Board has no control over the content on these web sites. Access to any other web site is at your own risk and the Board is not responsible for the completeness, accuracy or reliablility of any information, data, opinions, advice or statements made on these web sites.